1. In a large skillet over medium heat, melt the butter and olive oil. 3. Cook the gnocchi according to the package instructions. Set aside. 4. Add the vermouth and cook until evaporated. 5. Add the stock, cream, thyme, garlic, salt, and pepper. Cook until bubbling and it starts to thicken. 6. 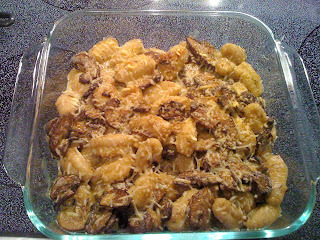 Add the cooked gnocci and cook until bubbling again. 7. Add the parmesan cheese and cook until sauce is creamy and yummy. I love to broil everything, so I poured everything into a cake pan, drizzed with more parmesan cheese, and placed under the broiler for 4 minutes until it was bubbly and golden. If I had an oven-safe skillet, I would have thrown the whole skillet in the broiler. I really don't think I can put into words how delicious this pasta dish is. I could have eaten the entire pan of it myself, but luckily I had someone to share it with. My meat-a-tarian friend couldn't stop raving about it either. As he said, this is a dish that you could make to impress someone, because it has such a great flavor, texture, etc., and if you didn't know better, you'd think this is really difficult to make. Dear readers, do you have any recipes like this one? Something with complex flavors that can "wow" your guests but is really simple to make? I'd love to hear about them, so that once I have furniture in my house, I can have a dinner party. Or a left center right/dinner party! Note: Since I first made this recipe, I've been able to make it "healthier" by cutting down on the oil and using Earth Balance. I've veganized it by making it without cream, too, and it tastes pretty good. Or you can also use MimicCreme instead of dairy cream. And obviously leave off the cheese if you're a vegan. So glad I remembered this recipe is here:) I've had a hankering for it.